With the Republican Party potentially headed to its convention without a clear-cut presidential nominee, The Onion answers common questions about how a contested convention would work. Q: What is a contested convention? A: A way to ensure the voice of the people is heard and then checked for any obvious mistakes. Q: How does a contested convention come about? A: Simply too many wonderful nominees to choose from. Q: How is a nominee chosen in a contested convention? A: A candidate must secure a majority of delegates and pin them down for 10 straight seconds. Q: How many normal, mentally balanced people will partake in the nomination process? Q: What happens if no clear winner emerges after the first round of voting? A: All 2,472 delegates immediately don Kevlar vests and tactical helmets. Q: How many rounds of voting can there be? Q. What is an unbound delegate? A. A national party representative who is allowed to undermine the democratic process if they feel like it. Q: What happens in the second round, when many delegates are freed up from being bound to their original candidate? A: The greatest power rush an Idaho county treasurer has ever felt in his life. Q: What are the risks of a contested convention? A: There’s a chance it could introduce an element of controversy into an otherwise congenial GOP nomination process. Q: When will concerns about the candidates’ beliefs disappear completely and blind, frothing rage take over? A: Around the fifth round of voting. Q: Is there a scenario in which John Kasich wins the nomination? Q: Will there be riots? A: Current convention rules require a quorum of 200 to form a riot. 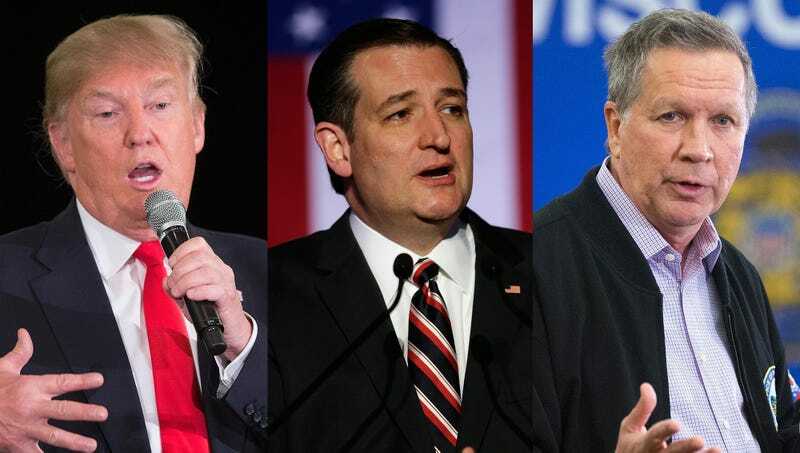 Q: Who is likely to be the winner of a contested convention? A: Donald Trump, regardless of whether he becomes the nominee or not. Q. Is this a sensible and logical way to determine a major party’s presidential nominee?